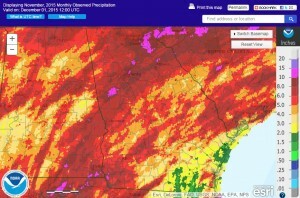 Rainfall across Georgia in November was wetter than average for most of the state, with the exception of the southeast portion of the state. Some areas in the mountains received more than ten inches above normal precipitation, hindering farmers who are wrapping up the harvest season and preparing for winter. 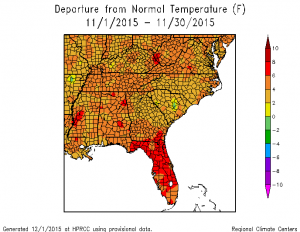 Temperatures in Georgia were several degrees above normal in November, particularly in the driest area. This is likely to be in the top ten wettest and warmest Novembers on record once all station observations are tabulated. Temperatures across the state were well above normal this month. In Atlanta, the monthly average temperature was 57.7 degrees F (3.7 degrees above normal), in Athens 56.7 degrees (2.9 degrees above normal), Columbus 61.1 (3.8 degrees above normal), Macon 59.5 (3.5 above normal), Savannah 64.2 (4.9 above normal), Brunswick 66.9 (5.1 above normal), Alma 64.9 (5.0 above normal), Augusta 58.6 (3.4 above normal), Albany 64.5 (5.8 above normal), Rome 56.0 (3.5 above normal), and Valdosta 67.0 (7.1 degrees above normal). The warmest temperatures were generally in areas where the precipitation was lowest. It was the seventh warmest November in Savannah, the ninth warmest in Columbus and Atlanta, and the tenth warmest in Athens on record. Several daily high minimum temperatures were tied or broken this month, including Savannah on November 2, Alma on November 4, 18 and other dates, and Brunswick on November 3 and 4. Alma tied their all-time record high November minimum of 72 F on November 4, matching the old record set on November 5, 2003. Alma also broke a record high temperature on November 2, recording 89 F, which surpassed the old record of 88 F set in 1961. The highest monthly total precipitation from National Weather Service reporting stations was 9.44 inches in Columbus (5.34 inches above normal) and the lowest was in Alma at 2.55 inches (0.07 inches above normal). Atlanta received 7.98 inches (3.88 inches above normal), Athens received 9.30 inches (5.48 inches above normal), Macon 6.89 3.57 above normal), Savannah 3.42 inches (1.05 above normal), Augusta 5.41 inches (2.59 above normal), Rome 5.77 inches (0.92 above normal), Brunswick 4.57 inches (2.54 above normal), and Valdosta 3.33 inches (0.77 inches above normal). 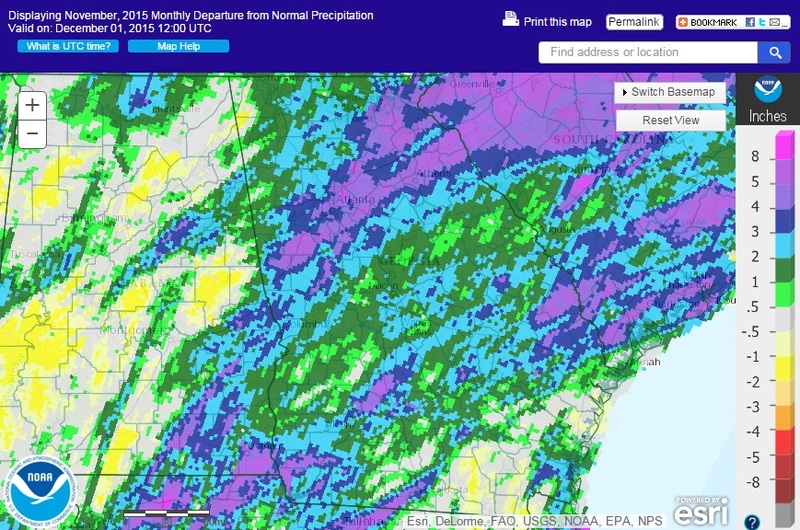 It was the second wettest November on record in Athens, the fourth wettest in Columbus, the fifth wettest in Atlanta, the sixth wettest in Macon and the ninth wettest in Augusta. A number of daily rainfall records were broken early in the month with the passage of a very wet storm system, which dropped copious amounts of rain across much of the state. New daily precipitation records were set in Columbus on November 1, Atlanta, Athens, Columbus and Macon on November 2, and Alma on November 3 and 8. The exact records can be found on the web sites for the local National Weather Service offices under Climate Data: Record Event Reports. The highest single-day rainfall amount from CoCoRaHS stations was 5.11 inches west of Sylvania in Screven County on November 3, followed by 5.00 inches in Sylvania on the same date. A station east of Bainbridge in Decatur County received 4.72 inches on the 19th. The highest monthly total rainfall from a CoCoRaHS station was 14.72 inches near Dillard in Rabun County. 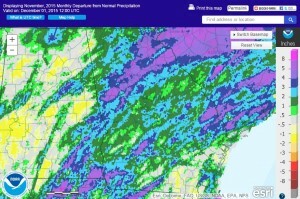 An observer east of Gainesville in Hall County received 13.32 inches in November. Two separate severe weather outbreaks produced tornadoes in Georgia in November. On November 1 and 2 a total of five tornadoes occurred in southwest Georgia, including one in Telfair County that did damage to a number of trees and two large irrigation systems. On November 18 three tornadoes occurred near Atlanta, including one EF1 tornado that produced an injury in Fulton County. You can read about the Atlanta tornadoes at http://www.srh.noaa.gov/ffc/?n=severeweathernovember18,2015. Wet conditions continued to plague farmers across the region during November. Rain impacted peanut and cotton yields and quality and made it hard for farmers to get into the field to harvest and to plant winter grains, particularly early in the month. Killing frost hit most of the northern half of Georgia by November 18. Inclement weather led to school closings in Telfair and Wheeler Counties on November 9. Due to the wet conditions, all drought was gone from the state by the end of the month. The outlook for December shows a continuing increased chance of warmer and wetter than normal conditions across the state, particularly in the northeast mountains. For more information please see the “Climate and Agriculture” blog at http://site.extension.uga.edu/climate/ or visit our new web page at http://www.gaclimate.org. Please feel free to email your weather and climate impacts on agriculture to share on the blog to pknox@uga.edu.